Grachelle is one of the many people affected by the seemingly unending issues between the LTFRB and TNVS. With Uber and other Transport Network Vehicle Services (TNVS) under the scrutiny of the LTFRB, the question of how to balance convenience and legality has once again been raised. TNVS came at a time when commuters are finally fed up with the government’s lack of action regarding inefficient transport systems and corrupt PUV drivers who give legit ones a bad name. While the LTFRB sees Uber and other TNVS as enemies, most see those who subscribe to them as simply people who are also trying to make a living, whether they be riders heading to work, or partners behind the wheel. 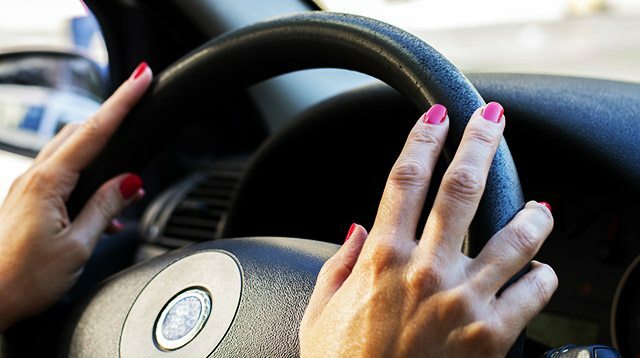 Grachelle is one of them, a thirty-something single mom of three who shared that being an Uber driver has helped her make more time for her children without sacrificing her income. "Ang hirap kasing i-balance 'yong time, saka kapag halimbawa may sakit 'yong anak ko... Ang hirap manghingi ng day-off." Despite juggling several jobs at a time when she worked in the US, Grachelle knew that being a mom came first. "Nakakahiya rin 'yong ma-le-late ka kasi 'yong anak mo may sakit, or mag-a-absent ka. So noong nag-work ako, minsan naka-LOA for six months, kasi may asthma 'yong youngest ko... Baby pa siya during that time, so kailangan ko siyang tutukan hanggang maging okay siya. Minsan one month siyang nasa hospital, so kailangan ko talagang mag-off ng matagal." After several years in the BPO industry, Grachelle decided to finally call it quits—"Kasi parang hindi na rin ako nagtratrabaho"—and find other ways to earn a living. Work came in the form of joining a ride-sharing service back in the Philippines, which her cousin introduced her to. When she started driving her two vehicles for Uber last September, she immediately saw the perks. "Naranasan ko nang kumita ng P20,000 a week kay Uber," she says, adding that she didn’t really have a strict schedule as to when she would go out and when she would stay in. "Wala akong oras, [but I work] every day except Sunday… Kasi ang ginagawa ko, halimbawa, hindi ako nag-Uber ngayon, tapos gusto kong ma-hit 'yong quota, babawiin ko ng ibang araw. Todo 'yon. Minsan nakaka-twenty trips ako a day." She also enjoyed having the time to fetch her kids from school without having to ask anybody’s permission, but knew that her flexible hours didn’t mean that she can simply slack off and expect to earn. 'Pag hindi ka naman masipag—natural! Saan ka ba naman nagtrabaho na umupo ka lang susuweldohan ka ng malaki, 'di ba? Wala namang kumikita ng pera sa madaling paraan." Grachelle is one of the growing number of women who have been signing up to become Uber partners—and her candid and often funny anecdotes reflect how much fun she was having with being a professional driver. When asked whether her first few trips were scary and if she felt nervous knowing that she was in a car with people she didn’t know, she answered: "Mas natatakot ako sa mumu kaysa sa buhay." However, one thing that Grachelle can’t stand is rudeness. "Kapag medyo arogante ang dating, medyo mayabang ang dating, hindi ko pinapagbabayad 'yon, hindi ko sinisingil." She noted that she doesn’t take money from rude passengers as a sassy reminder that she was no one’s personal driver. It’s her car, so riders should respect that and play by her rules. And speaking of rules, Grachelle has several which help her stay safe and keep her vehicles road-worthy. "Kasi strict ako," she said. "Hindi ako pumapayag sa multiple drop offs, lalo na sa gabi… Hindi ko kayo kilala, hindi niyo 'ko kakilala. Ayokong i-compromise ‘yong safety ko. Kasi you’ll never know [baka biglang] may isakay sila. Point A to Point B lang tayo. Kapag may ipapadalang paper bag or mga kahon, ayaw ko ng mga ganoon. Bawal kumain sa kotse." Riders who break any of her rules would immediately get their trip cancelled, and for Grachelle, they’re not really losses. "Iba-iba talaga ang tao… Malalaman mo ang dating ng isang tao pag-upo pa lang," she said, citing one incident about a passenger who argued with her over taho, and another about one who discriminated against her. "'Pag tawag, sabi, 'Ay babae, ayoko.' Babae rin ['yung passenger]. Pero once lang nangyari 'yon. 'Yong iba mas gusto nila kasi mas safe sila." Despite the craziness that being an Uber driver has brought her (including that one time when she had to drop off hundreds of siopao) Grachelle confessed that she would still continue being an Uber driver. "Nag-e-enjoy ako. Mas gusto ko ito kaysa naka-upo ako [sa office]… Kahit saan ka mag-work mayroon talagang mga nega na tao. Hindi naman mawawala 'yon kahit nasaan ka. Eh 'yon nga nakakasama mo maghapon sa work; ito saglit lang, nasa sasakyan lang kayo, 'di ba? Puwedeng hindi ka sumagot, unlike 'pag kasama mo sa work na, ‘Ano ba 'yan, bukas nandirito nanaman 'to,’ 'di ba? [SaUber], ‘Ay bukas naman hindi ko na makikita ‘to.’ Basta gan’on lagi ang iniisip ko 'pag mayroong mga pasaherong nakakainis. ‘Mahatid ko lang 'to ng safe sa pupuntahan niya, okay na 'ko." 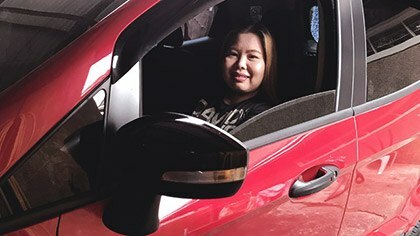 Grachelle is only one of the many people Uber has behind the wheel, and one of the many affected by the seemingly unending issues between the LTFRB and TNVS. Technology has muddied the waters on what’s legal or not, but for many who suffer through the tiring commute around Metro Manila, Uber and other TNVS drivers are life- and sanity-savers. We do hope that instead of butting heads, both parties come to a consensus with the public in mind, because in the end, it’s their best interest that both the government and service companies should cater to.